This article has been published in the BSD Magazine, January 2013 edition. Here is the link to a local copy I keep. You better read the PDF, that has been reviewed by the editors and I didn't update the article here yet. If and when I do this I remove this message and at that time probably the text will be more complete than the PDF as I won't resist to extend it a little more. In this article I am going to show you what 360×180° panoramic photography is along with a few of its possible applications. I hope I can show you how fascinating it is. Panoramic photography is one of the most complete ways of experiencing a location without physically visiting. That is one of the reasons why it is also called “Immersive Photography”. In the following sections I hope I can inspire you to try it out with tools available under a BSD or any Unix like system, using only free open source software. 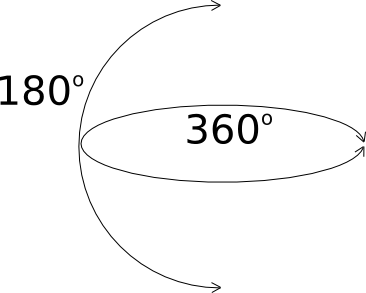 the main tips and tricks to transition completely to 360×180°. Neatimage: noise reduction tool - http://www.neatimage.com/)) This is a very good noise reduction tool. 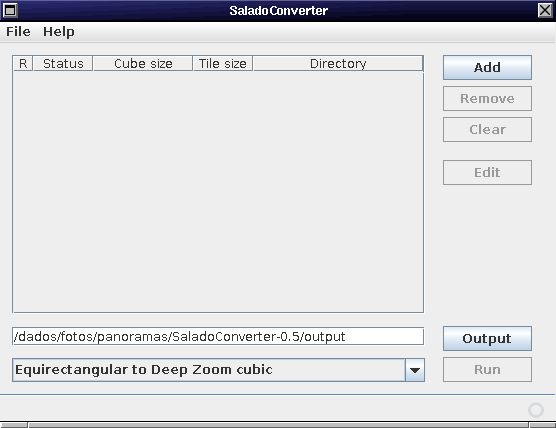 It is not opensource, but has a free version that deals with JPG images and is available for Linux, Mac and even Windows! As I have said, I run the Linux version with no problems in my FreeBSD desktop. In Figure 14 a closeup in a section of an example image with much noise. It used ISO 6400 and with higher ISO values the noise gets stronger. In Figure 15 the same section treated with Neat Image. | | | | * ImageMagick((ImageMagick - Convert, Edit, and Compose Images. A very powerful and mature command line tool set to manipulate images - http://www.imagemagick.org/)) What to say about ImageMagick? It can make almost everything with images in the command line. It is a very mature and powerful set of image tools to do many many things related to pictures. Here I mention it as an alternative tool to use as noise reduction filter. It can take a little more time to calibrate the parameters to use, but, as in panoramas we use many similar images, it can save you much more time using it in a script to process all the panorama images in the same way, as it needs to be done. I have tested the commands suggested in the ISONOISE script done by Fred((Fred's ImageMagick Scripts: ISONOISE - http://www.fmwconcepts.com/imagemagick/isonoise/index.php)). The suggested command sequence is: convert $infile -median $radius $tmp0 convert $infile $tmp0 -compose Difference -composite -threshold $thresh% $tmp1 convert $infile $tmp0 $tmp1 -compose src -composite $outfile You must change $tmp0 and $tmp1 to temporary file names, $infile and $outfile for the the input and output files and $radius and $thresh% with the radius and threshold values. Those last two are the ones you change until achieve the result desired. Notice that the parameters used as variables are ready to be used in a shell script or you can also download the ready made script from Fred's mentioned site, of course. Notice, however, that they are bash scripts prepared to use bash installed at /bin/bash and bash is not installed by default on BSD systems. I got the result shown in Figure 16 with a radius of 30 and a threshold of 0% using the commands directly, not the script (it made difference as the script doesn't do exactly those commands). Watching the pictures in a larger size in my computer I consider the resulting image using ImageMagick better than the one using Neat Image, but it can vary from image to image. Other tries can be made with the approaches done by Fred in his scripts called noisecleaner, denoise, statsfilt or others. * Enfuse((Enfuse: exposure fusion tool - http://enblend.sourceforge.net/)) This tool is able to make exposure fusion. Imagine a scene where the contrast is too high. In Figures 17 and 18, for example, I took a picture inside a living room with daylight outside. It is really difficult to make one only picture showing at the same time the details of the dark and the light parts of the scene. To solve this problem we can take pictures with different expositions and combine them with Enfuse. At the end we will have a picture showing good details in all areas, like I did in Figure 19. In full sphere panoramas the chances to have areas with different lights are obviously higher. | | | | | In the following table the result of a searching I have made of the avaiability of those tools in the most known BSD systems. | Application| DragonFly BSD| FreeBSD| NetBSD| OpenBSD | | UFRaw| GIMP plugin| YES| GIMP plugin| YES | | Raw Therapee| NO| YES| From FreeBSD| NO | | Darktable| YES| YES| From FreeBSD| YES | | GIMP| YES| YES| YES| YES | | Enfuse| YES| YES (within enblend)| YES| YES | ====== Mounting a complete panorama - Step 2. Joining images (Stitching) ====== After all image treatment is over it is finally time to join the pictures and make the panorama. The tool for this is Hugin((Hugin stitching software - http://hugin.sf.net/)). It will do all the distortion, rotation and position job to make a perfect stitch with our images. The stitching is probably the hardest part of making a full sphere panorama. It can be made in many different ways, even considering only the use of one tool, and there are many tools for it. Any way you choose to do it can lead you into some problems and to solve many of the possible problems you will need to understand some concepts understand better the tool used. I will try to talk first about the automatic process, then will give you some hints to try to use a partial automatic process. The most guaranteed, although, is the manual process, but it will surely take more of your precious time. Take a chance to read the many tutorials available at Hugin's site and also all over the Internet. We can use the tool with it's automatic wizard or we can use more manual steps and take control of what it does. Each choice has it's price. The automatic can fail to find common points between images or to align the panorama and the manual way is a little complex, which means that you will need some time to learn some concepts and try a lot before get experienced. The wizard is available in the first tab, shown in Figure 20. To use the automatic way We need to press only three buttons to finish the panorama, generating a final equirectangular tiff image. For this automatic process to work it is very important that the pictures were very well done, with enough overlap and preferably using the NPP. So you can try the three buttons: - Load images… - Align… - Create panorama… If you are lucky you can then jump to the step where I suggest how you can visualize the immersive panorama, at the end of this section. Depending on your camera, the loading images step can show you a window to fill some values about your lens and sensor. It won't happen if your camera already writes those values in the image file, but if not, the window on Figure 21 will popup. It is not very important to fill it correctly. The optimization steps will find the better values. One very important thing to set is the lens type. Be sure to set it to fisheye (any) or stereographic if you are using a fisheye lens or keep it with “Normal (rectilinear)” if you are using a normal lens, otherwise the optimization will fail, automatically and manually. If you don't know the other values, just keep “1” in the “Focal lenght multiplier”, fill a reasonable angle in the “HFOV”, which should be the horizontal field of view of your lens in angles and the “Focal length” will be calculated. If the automatic way fails we can try the manual, but before that there are a couple of things you can still try to make the automatic work. One first hint is to try to stitch one horizontal line of images first. Then you can insert other lines in next steps. Some scenes can be harder to stitch, like those made with narrow lens that can have images without visible common points. Also very hard are the images with moving objects, like clouds, trees in the wind, moving people and so on. A second try to make the automatic work is to generate the called “key files” before aligning. The generation of each image “Control Points Candidates” is a high memory consumer process. The strategy is to save this information in files, so the step is done before trying to match Control Points between images. To do that, first load your images and save the Hugin project file. After that, open a command line. Supposing you are in a BSD system, do this in your csh/tcsh: foreach i (`jot 10 0`) cpfind -k $i project.pto end This commands suppose you have 10 images in your file and the Hugin file is called project.pto. That jot command will generate ten numbers starting at zero and the foreach will make a loop until the end. Adjust the steps to your case or simply run cpfind -k N project.pto for N between zero and the number of your images minus one. After that try again the automatic process. Going to the manual mode, the first step is to find common points between images. Those are called Control Points or just CPs. To find them it is mandatory that we had overlapped a little each image pair. If you did this, now it is time to show Hugin that, for example, that little rock in one image is the same as the rock in the other image. Using these CPs Hugin will be able to distort, roll and position the images to stitch the panorama. Some manual steps have been shown in the tutorial mentioned in section “Mounting a simple panorama”. That tutorial lacks some other important concepts, so here follows some hints to add manual control points: * there are normal CPs, vertical line CPs, horizontal line CPs and lines((Hugin tutorial on creating architectural projection - a good reference for creating vertical lines - http://hugin.sourceforge.net/tutorials/architectural/)), * the most important are the normal ones, the ones you set between two images that overlap, * the lines are set in only one image, putting it in both sides of the panel, like in Figure 23, * set at least 2 CPs between each image pair: I usually like to set 3 and the automatic process usually set around 20, * add CPs distant one from another: I try to put one in the top, one in the middle and another one in the bottom of each overlap of two side by side images, * don't set CPs over moving objects like leaves, clouds and people, among others, * add at least one horizontal or vertical line at each two images: this is not something you must do, but will help to level the panorama. In Figure 22 we can see the “Control Points” tab with a normal CP. Notice that it is set between two images. We put one image in the left and another in the right to add this CP. I have set more CPs between those images, but have shown only one in the picture to simplify. To set normal CPs: * choose the “Control Points” tab, * choose one image in the left panel and the next image in the right panel * optionally unset the options “auto fine-tune” and “auto estimate” (i like to unset them), * try to look at a good candidate to a control point and click on it in one of the images (any of them), * the software will zoom in the clicked image so you can optionally reposition the point, * click on the correspondent point in the other image, * the software will zoom in the other image too, so you can reposition the second point, * optionally click the “Fine-tune” button or use the “f” keyboard shortcut to make an automatic fine adjustment, * click the “Add” button or use the “a” keyboard shortcut. Notice in Figure 22 the point defined by the small blue rectangle with a zero inside. This is the CP number. Right beside it there is a small cross, which is the specific place where the CP is located. Set more CPs until you have the desired number of them between the two images. Remember to set at least two and to make them far from each other. You can navigate to the next pair of images using the small green arrow between the image names. Don't forget to close the circle making CPs between the last and the first image. About the other type of CPs, in Figure 23 we can see a line CP. Remember math classes? A line is defined by two points. To set a line we put the same image in the left and right panel and add the two points that define it. In Figure 23 there is one point of the line in the upper part of the window and another in the lower part. Usually I set vertical lines at each two or 3 images. In a 10 images set, for example, you can try to set around 5 vertical lines. Sometimes it is not possible, because there is no vertical line. In nature pictures, for example, it happens. You can then try horizontal lines or don't use it at all, leveling the panorama by hand after optimizing it. I will show it in a while. After setting up the CPs it is time to “Optimize”. This is the process in which the tool makes many interactions to distort, roll and reposition images until the Control Points are positioned as good as possible. This means that a point, represented in one image, must be positioned right over the same point represented in the other image. Usually it is impossible to make all points get perfectly positioned with its pair. The measurement to see if the optimization went well is the maximum and average CPs distance. The utopian case would give us 0 distance for all CPs. The “Optimizer” tab is shown in Figure 24. I usually do my optimizations in three steps. In any optimization the program takes the actual positions and distortions and try to change the requested parameters to achieve a better result. It means that it is a good idea to save the project without any optimization, so, if you want to try a different approach you just reopen the file. The following are the steps that I use in most cases. First I ask it to change only “Positions (y,p,r)”. Those are angular positions: yaw, pitch and roll. It changes the images positions around the sphere of the visual area. After optimizing positions, usually the result is not the best. 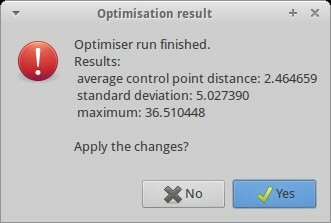 The average and maximum CPs distance are still too high, but I accept them in the confirmation dialog, like the one in Figure 25. It shows a very good result for a first position optimization. After this first step the values can be much higher, like hundreds of points in the maximum distance. As a second step I optimize “Positions and view (y,p,r,v)” and accept the result again. The final optimization is “Everything without translation”. If I try this last option first, usually the result is something really crazy. After optimization it is a good idea to check the “Fast panorama preview window”, what we do by clicking the little blue and green button shown in Figure 26 and the window shown in Figure 27 shows up. The “Fast preview” window is not only to look at the panorama, we can make some adjusts on the resulting image. Notice the tabs, each one with a specific purpose. 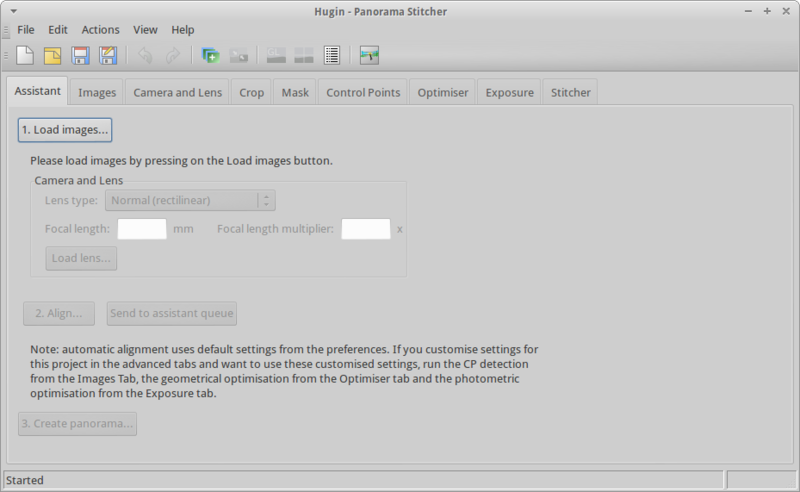 Specifically the “Move/Drag” tab, shown in Figure 28, is important to manually level the panorama as I have mentioned. Using it you just click and drag over one picture and the others, that are connected to it by the CPs, move according to your needs. Other buttons can be very useful for partial panoramas, like the “Center” and “Fit”. The “Straighten” button will make a try to level the panorama. You can also test it and use Ctrl+Z if it fails. After optimizing it is time to generate the final image. Sometimes it is still interesting to make some adjusts using masks, reviewing bad CPs, setting up lines and re-optimize. When the result is good enough we go to the Stitcher, shown in Figure 29. The hints for this tab are: * the “Equirectangular” projection is the most common and we will use it, * use the “Calculate Optimal Size” to have the better resolution of the final image, * chose your preferred output format from TIFF, JPG or PNG, * if you want each individual image distorted and replaced to make adjusts in an image editor, choose “Remapped Images” and in “Nona” options unset “Save cropped images” Choosed your options, just click in the “Stitch!” button and voila! … well, it is probably going to take some time to Hugin to finish your image, just be a little patient and watch the progress. In fact it is also a good idea to save the file before stitching. That ready made image can be viewed interactively with viewers like Panini((Panini panorama viewer - https://sourceforge.net/projects/pvqt/)) before being published. It is necessary to compile it under BSDs, but it is not difficult. You just need to install some qt4 dependencies and follow the instructions in the panini-build.txt file. You can try to find other options here:	http://wiki.panotools.org/Panorama_Viewers#Stand_alone_Viewers or you can jump to the publishing section. ====== The little planet format ====== Well, there are many little planets in the article, so I think I must talk about them. They are a very interesting format of the full sphere panoramas. In fact they are a specific projection, as already said, that is one of the most interesting to get your panorama printed. To do them I prefer to finish the equirectangular and even the final corrections, mentioned in the next section Post editing. Then you come back to Hugin, and that is why I am talking about it here. finish the final positioning by dragging and moving the picture, then you can stitch as you have stitched before: choose your image size and stitch it! IWarp filter (inside “Distort” filters). generate a new image to edit into GIMP and then do the steps back. put the name of your XML file in place of bn.xml (or use it as your file name).